Add some zooming fun and color to your child's party. Join Dusty Crophopper, Windlifter and all their high-flying friends for a party that will leave your child floating on air. 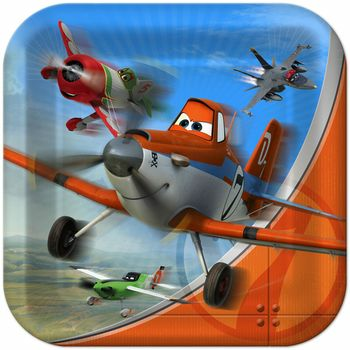 Disney Planes Birthday Party 9" Square Lunch Plates, 8ct. Bittersweet 7" Salad/ Dessert Square Paper Plates 18ct. Disney Planes Birthday Party Lunch Napkins, 16ct. Disney Planes Birthday Party 9oz. Paper Cups, 8ct. Etched Lillian Silver Plastic Teaspoons 48ct. Etched Lillian Silver Plastic Forks 48ct. Etched Lillian Silver Plastic Knives 48ct. Disney Planes Birthday Party Invitations, 8ct. Disney Planes Birthday Party Plastic Treat Bags, 8ct. Disney Planes Foam Flyers Party Favors, 4 ct.
Disney Planes Birthday Party Banner, 1ct.